Husbn-wife romance Korcilo,Hotat Dorjay Ke Jeno Nok Korlo.wife Palaw Palaw Mone Hoy Amr Husbn- Asce.Husbn-O Palate Suru Korlo,Husbn-Dorjar Bahir Theke Fere Aslo,Husbn-Acha 2mr Husbn-To Ami Tahole Voy Dekhale Kno.Wife-2mr Ki GotoNa 2mi Husan-Der Kotha Sune Palate Suru Korle Kn. Baba: Bujhli Khoka, 1 Jaigai Bar Bar Gele Dam Kome Jay.Khoka: Se Jonnei To Ami Protidin School E Jay Na, 2mi To Seta Bujho Na..
Boss: dekhoto amr number a k call dicy. Manegar: call girl. Boss: what amr fhone call girl fhone dicy. Manegar: na boss mane meye fhone dicy. Wife;Ai Sono Ami london Jachi 2mr Jonne Ki Anbo? husband;Amr Jonne Akta British Meye Niye Aso,Wife; Asar Por.Husband;Koi Amr Gift Koi?Wife;Opekha Koro 10 Mas 10 Din Por Pabe. Protita Meye Chay Tar Pichone Jno Sob Chelei Guruk.Jar Fole Akta Meyer Piche Kom Kore 10ta Gadha Thake,Kintu 14ei Fabruary Te Akta Gadha Gurte Pare Baki 9ta Gadha Atimer Moto Pore Thake. Hizla:Baba amar biye hobe na? Baba:Hobe hobe chinta koris na,tor biyer jonno patroder ke sms Post Kore Disshi.Sms pore hasle bujbi patro razi achey..! 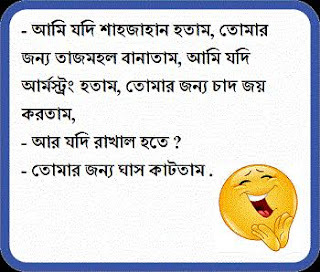 Sir: 2mar Moto Meye S.S.C Fail korbe Ami Vabtei Parini_ Meye: Sir Baba Bolecen Fail korle Biye Diye Dibe, Tai Sujog Ta Hat Sara korlam Na..! Girl:Ish! Ami Jodi Mobile Hotam.Sobai Amk Kiss Kor2. Kane Laga2.Buke Rak2.boy:1Bar Cinta Kore Deko2;Charger Ta 2mar Kon Jagay Laga2.Girl:what? Boy:Yeas..! Agami 31 april 2014 Por Theke Mysmsbd.com Abong Sokol Account pages Bondho Kore Dawa Hobe Bole Sidanto Niche Syon Vai.Aro Bolece Jara smsbd UsE korbe Tara 50 Dolar Kore Dite Hobe.Sathe 1ta Khusir Khobor Ache Seta Holo Kono Bochore april Mase 31 Din Nai. Din Nai. Boy:I LOVE U. girl:Your Request Is Processed Successfully,,Pls Wait For My Hasband Divorce. boy:Sorry Sending Failed. Girl: Plz Try Again..! Sir: H.S.C er Purnorup Ki Jano?. Stu: Headmaster Sendel Chor... Sir: Haramjada Soytan Chele... Stu: Apner Purno Rup Ta o Motamuti Thik Ache...! 4ta Pipra 1 Bone Hatcilo,Samne 1 Hati Astese,Tadekhe 1Pipra Bollo Amader Uchit Oke Mere Fela.2 Pipra Ra Na Chol Amra Hatir Paa Venge Dai.3 Pipra Na Tar Chye Valo Amra Amader Poth Theke Soriye Dai.4 Pipra Ra Na BadDa Amra 4jon O aka,Sudhu Sudhu 1 Osohay Ke Distap Korar Ki Dorkar. Doctor Apni To onek Vagoban,Vago valo je apnar dan hat kate ne.Lok-Ha ha Budhi Thakle sob ei hoy.Doctor ki vhabe.Lok kaj korar somoy amr dan hat masine kate jate dhorcilo,Tokhon Ami Amr Dan hat berkore Bam hat dukiye Disi. Ak Sathe Bose Husband Nd Wife Tv Dakcilo,Husband Wife K Bollo O Go 2mi Ki Amy Amon Kichu Bolte Parbe Ja Amy Kosto Dibe Abar Anndho O Dibe.Wife Bollo Jan 2mr Friends Der Modhe 2mi Bichanay Onek Time Tikte Paro. Meye:hello apni ki bibahito? Boy:Na. . . ! Meye:Haramjada ami tor bou basay asle dekhabo moja. *kisukhon pore* Meye:hello apniki bibahito. Boy:Haa. . . ! Meye:Soytan tui amar sathe beimani korle.